The Patriots and Chiefs will be playing the first game of the Divisional round of the Playoffs. As of now, the Patriots are a 5 point favorite over the Chiefs, however the Chiefs are currently the hottest team in football. While the Chiefs are coming off of a strong 30-0 victory over the Texans on the road, the Patriots have not been playing nearly as well as they did for the first 9 games of the season winning only 2 of the last 6 games. In the last week of the season the Patriots even lost their spot as the #1 seed with a crushing defeat to the Miami Dolphins. From the start of the season, everyone assumed that the Patriots would easily be the one seed and go straight to the Super Bowl, however many doubters are forming as a result of their recent struggles. One of the Patriots biggest struggles though it that they have been plagued by injuries this year. Meanwhile, the Chiefs have not let up more than 20 points since their hot streak. The Chiefs offense this year isn’t bad either and is arguably a top ten so if the Patriots are going to walk away with a win. Odds are, they will need to break the 20 point barrier. As of now there are several extremely important factors that can change the outcome of the game. One of the biggest factors is the return of Edelman. With Edelman, the Patriots went 9-0 and without him the Patriots averaged about less than 100 yards per game. No one can tell how Edleman will do until the game is over, however it is certain that Edelman has the potential to help lead the Patriots to a victory over the Chiefs. On the opposite team, the Chiefs must deal with Jeremy Maclin’s ankle injury. While many Chiefs fans breathed a sigh of relief when they found out that he did not tear his acl, Maclin is listed day to day and most likely won’t be performing his best during the game so other players such as Jamaal Charles will probably need to get the ball more. With that said, the Chiefs right now are the hottest team in football, but the question is, can the Chiefs win a game in Gillette Stadium. In the past three years the Patriots have only lost one important game in Gillette Stadium so it will be interesting to see what both teams accomplish on Saturday. 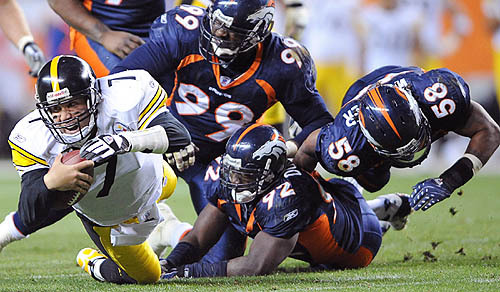 On Sunday the Steelers will be heading to Mile High Stadium to face the Broncos in a week 15 rematch. While the Steelers did win 34-27, this week will be much different. Unfortunately for the Steelers, Antonio Brown is out with a concussion and while Ben Roethlisberger can play, his throwing arm is somewhat injured which will have a huge impact on the game. To make matters worse, Antonio Brown had two of the Steelers three touchdowns in week 15 with 189 yards. If the Steelers hope to win, other guys like Martavis Bryant must step up. As for the Broncos, Peyton is back and there is a lot of uncertainty surrounding him since he is coming off an injury and since he hasn’t had a good season. Of the ten games that Peyton has played this year he went five games without a single touchdown and as a result many believe that keeping Osweiler as starter would actually be a better decision. Another major factor that many forget about is that the Broncos are home in a stadium where the altitude is so high that it can become a major killer. People forget how often the Broncos have gone undefeated at home and received all of their losses on the road. Just last year, the Broncos went 8-0 at home and 4-4 on the road. When the Broncos are at home, their games often result in the opposing team breaking down from exhaustion in the second half while the Broncos keep playing. As a result, Sunday’s game looks like a sure win for the Broncos, however Big Ben has been known to bust out some incredible wins so the outcome is not fully certain. Posted in Denver Broncos, Kansas City Chiefs, New England Patriots, NFL, Pittsburgh Steelers.